Mitt Romney, happy "What About Your Gaffes?" Day. Like it or not, gaffes actually make a difference. The campaign that followed was surfeited with “gaffes.” Weeks later, the Republicans would base seemingly 75 percent of their convention on the shame of Barack Obama’s “you didn’t build that” comments. Weeks after that, the leak of a video from a Romney fundraiser—the “47 percent” tape—would do so much damage to the candidate that we know the Obama campaign started to consider the race won. (They panicked again after the debate in Denver.) But few gaffes are “47 percent”-sized. During the election, GWU’s John Sides tried and tried to show the press evidence that the gaffes that captivated them didn’t move the electorate. Sides is coming out with The Gamble, an exegesis of 2012 campaign data. 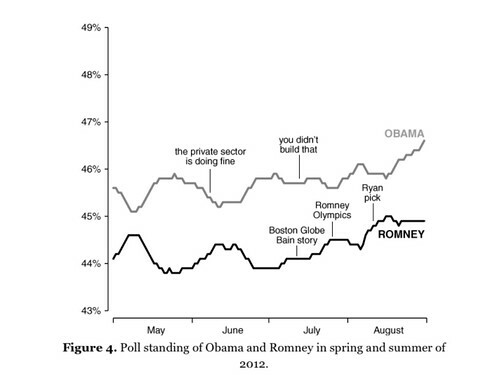 One of my favorite charts, from a chapter titled “What About Your Gaffes?,” shows how little the polls moved after every explosion. “Romney Olympics” was the gaffe he made en route to Europe, worrying that London was behind on Olympics prep. Yes, it offended Brits, but it didn’t matter. Every year, on this day, let us raise a glass and remember how little gaffes actually affect presidential campaigns. Oh, and toast the Polish people. Show some respect.